The other option would to have, say, smaller primary schools with smaller catchment areas so children could walk to school and not have to navigate any dark paths or busy roads. 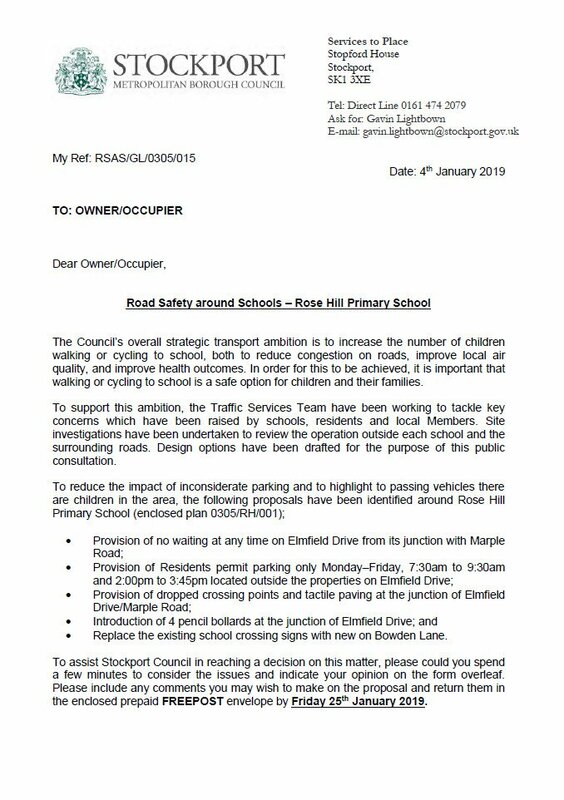 thereby reducing traffic and pollution, making the areas around schools safer AND getting children walking and breathing fresh air.... shame they built the new, bigger school at Rose Hill eh! Another triumphant decision by someone in power. Perhaps one on Cross Lane that served the south of the area, one up near Windlehurst that serves the Hawk Green area and an additional school on the north of Stockport road to capture those who live in and around the Marple Hall estate. Why is Marple unable to do the same for all the roads near our schools? as to why? .... because we fall under the auspices of Stockport Council! The streets around a school temporarily become pedestrian and cycles only at set times in the morning and afternoon. Vehicles are not permitted to enter the street between these times unless they have been granted an exemption. You can register for an exemption if you're a resident living or working in a school street zone, a business in a school street zone, or a blue badge holder. Someone has to pay to police this, daily traffic wardens, police, cameras or vigilantes (which could get fun!).. it's all about being "seen to do something" but without spending any money and therefore justifying one's position as a council officer, councilor, MP or otherwise. This seems to be taking very little action, just enough that it can be claimed that "something is being done". When I was a little girl living over my family's business on Market Street I walked to & from Rose Hill Primary school every day. I was escorted by Mother or Grandmother while I was in the infants and then walked alone or with the little boy from next door when I was in the juniors. Many years later when I was teacher training I had a teaching practice in a primary school in the Brecon Beacons. Some children lived in the village but others walked in from outlying farms in all weathers. While I was there there was a very bad snow storm which resulted in snow several feet deep (up to my thighs as I walked to school along the main road) The school was not closed and we had nearly a full complement of staff and children, INCLUDING A RECEPTION CLASS CHILD WHOSE MOTHER WALKED TO SCHOOL LEADING HIM ON THE FAMILY PONY FROM A FARM 2 MILES AWAY!!! She then walked home and repeated the journey in reverse at home time and repeated the performance every day until the thaw when she started using the tractor or the the family car. What the h*ll is the matter with parents these days? Supply your child with a pair of sensible shoes and suitable outerwear, instructions not to talk to strangers and to come straight home without dawdling and let them get on with it. They'll be a lot healthier and their behaviour will be improved both at school and at home due to the exercise they are getting. Its not like the roaring fortys any more . Speaking as someone who walks their child to school regularly, I can tell you that a sizeable number of Rose Hill's pupils walk, scoot or cycle to school every day, either alone, or with parents/grandparents/guardians/whoever. It's a 10-15 minute walk for us. We know people who walk further. From what I have seen, the majority of those driving (and I won't judge people who do drive, because I don't know their circumstances) do behave responsibly. The problems with parking are caused by a small minority. There is already restricted parking on Elmfield but it is not policed. Residents permit will probably be chargeable and then not policed. As a deterrent, it needs to be permit holders only 24/7 on the proviso they are issued Free Of Charge. Just a couple of comments on this if I may. This is information I have got after meeting with Town Hall Officers. The residents scheme will be chargeable and as per Council guidance this charge is to ensure a minimum of 1 visit per week of a Council parking attendant who will issue fixed penalties to vehicles without correct permits. The parking scheme of 24/7 was looked at but not moved forward as the road is only problematic at the times that the parking restrictions apply. I hope this answers the points you have raised. I'm glad they're doing something about it. I had kids at Rose Hill until 2007 and it was terrible then. 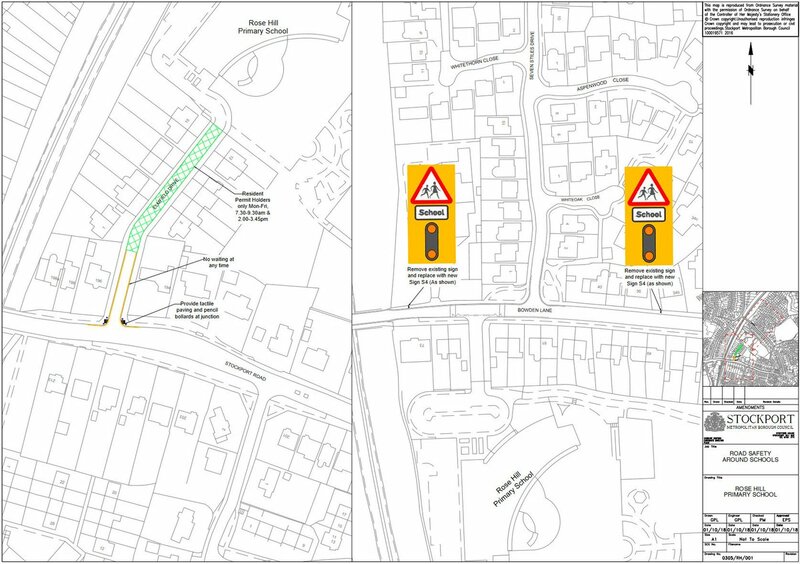 However, what they're proposed will only address the Elmfield Road problem, and ONLY if it is enforced. Don't look for the light at the end of the tunnel - stomp along there and turn the bl**dy thing on yourself! Also those pencil bollards look nice. 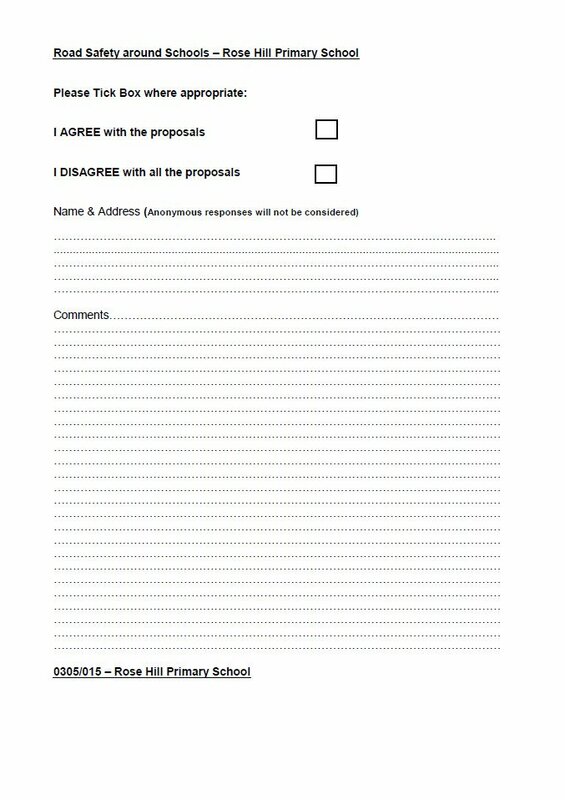 The council has issued a consultation about proposed measures to combat antisocial parking around Rose Hill School. On the face of it this consultation appears to be aimed purely at residents in the immediately vicinity of the changes only but I've seen email correspondence between Cllr. Annette Finnie and the Officer responsible suggesting that they will accept comments from all interested parties. Replace the existing school crossing signs with new on Bowden Lane. The letter to residents is also attached along with the form for returning comments. As you will see, the letter refers to a FREEPOST envelope that was also sent to residents. Gavin Lightbown, the Council Officer responsible for the consultation, has confirmed that they will accept emailed comments from all interested parties, so please do this by emailing him using gavin.lightbown@stockport.gov.uk to send in your comments before the consultation closes on 25 January 2019.